Fine weather continued into nightfall for the final move of Day 2. With no intelligence gained this turn and no aircraft in the air it was straightforward ship movement. Axis forces continued their random movement on patrol with the allied main fleet to steaming towards their destination. A note about the counter blue '1'. This is the Kormoran which in the campaign was purely to be a troop transport rather than the famous Armed Merchant Cruiser. However, I have had second thoughts and it will be that AMC. I apologise to the purists as this is of course totally unhistorical, but having acquired it together with all the other AMC's in a pack from Navwar, felt it would add a little more spice to the campaign. I have reduced it's troop carrying capacity to that of a cruiser and it will now roam the map looking for victims. The first move of Day 3, another night move, saw the fine weather continue and the Axis forces gained intelligence about red '2'. 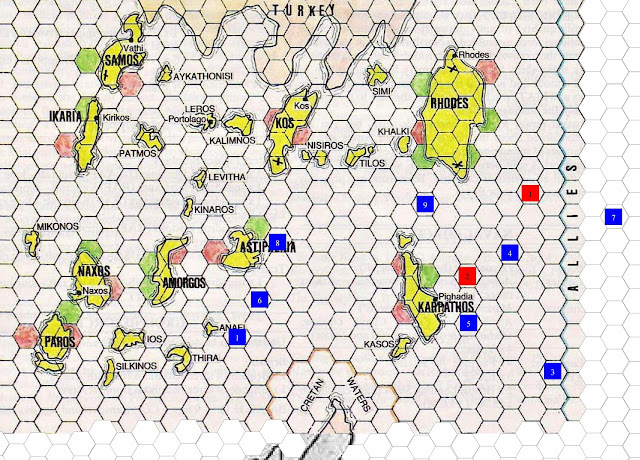 The allied force having split in two with '1' heading for Rhodes and '2' Karpathos. The only Axis naval units that can pose a realistic threat to the allied fleets are the 2 U-boats, blue '3' and '4'. They make for the location of the fleet sighting and other units close the gap should any opportunity arise for them to intervene with any stragglers etc. Dawn breaks at the start of move 2 with fine weather. A number of sightings/intelligence reports have been made. Intelligence has confirmed to the Axis forces the location of the allied fleet 'red 2'. For the allies they have received information regarding the U-Boat 'blue 4'. A Greek fishing boat crew in Karpathos were overheard by Italian troops to say that British forces had landed on Kasos. With the fine weather, Arados once again took to the skies to patrol for any allied forces. 2 x ME110's were placed on CAP around Rhodes. With most of the Axis torpedo bomber force out of action, the task of attacking the allied fleet 'red 2' was given to the 9 x JU88's escorted by 6 x Folgores out of Kos. They were detected at 10,000 yards from the fleet with the only available aircraft, 1 x Seafire already in the air, sent to intercept. All available Allied bombers in Cyprus (7 x Bostons and 12 x Mitchells) were sent to attack the airfield at Cattavia in Rhodes escorted by 9 x P38's and 10 x Hurricanes. They are sighted on the approach to Rhodes by the ME110 CAP. The ME110's alert their base but only the 2 x Saettas and 2 x ME110's at Cattavia were available that could reach them in time. Those few fighters were duly scrambled to reinforce the CAP who were now already engaging the allied bomber force. In response to intel regarding the U-boat 'blue 4', 2 Swordfish from Avenger were sent to investigate. They successfully locate the sub and prepared to attack. The air phase will be completed before the ship map moves are made for this turn. 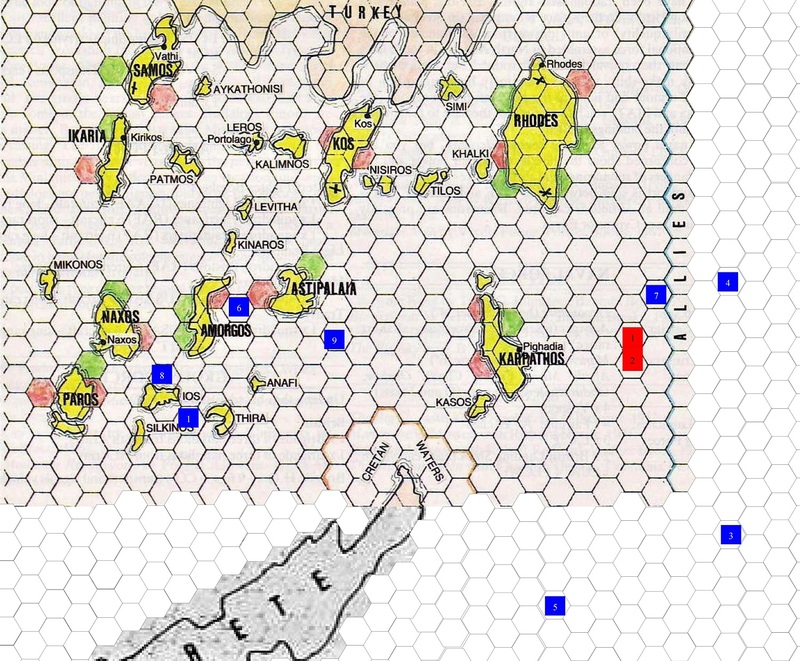 The first action will be the allied attack on Cattavia followed by the Axis bombing raid on the allied fleet and finally the Swordfish attack on the U-Boat. Appreciate your comment Peter. Many thanks. I quite like the hand-to-mouth aspect of a backwater campaign. Adds interest as both sides juggle exiguous resources. I agree and one of several reasons why I do enjoy playing out campaigns. We will have to see if the allied ill luck continues! They certainly need a change of luck Peter.